Pope Francis said the evangelization of secular society requires focusing on the essentials of Christianity in collaboration with other Christian churches. The pope made his remarks on 17 January at a meeting with representatives of the Lutheran Church in Finland, who were making their annual ecumenical pilgrimage to Rome on the feast of Finland’s patron, St. Henry. The meeting occurred one day before the start of the annual Week of Prayer for Christian Unity. It has been almost 50 years since the publication of the Decree on Ecumenism. It would be a mistake to underestimate the tremendous progress that has been made as Christians come to a deeper understanding of what we believe as we work toward the unity willed by Christ. That is not, however, a call to self-satisfaction. 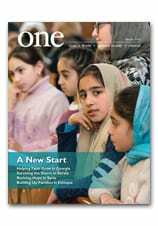 Read more on the issue of ecumenism in the Summer 2013 issue of ONE.